Book hotel rooms online with us at Vila Gale Marina Hotel at the lowest rate, guaranteed. 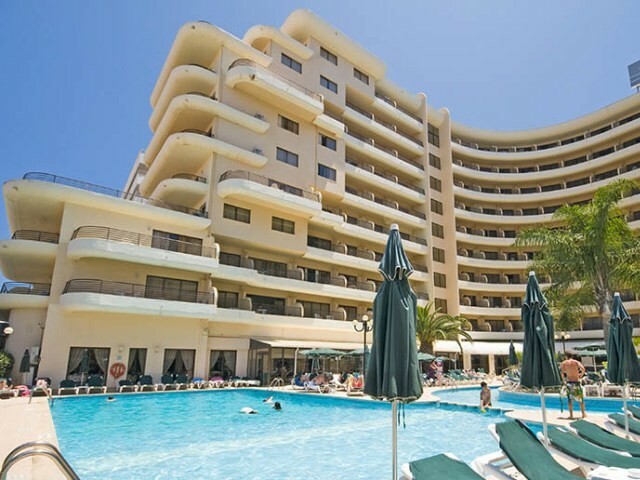 Get your holiday discount room rate at the 4 Star Vila Gale Marina Hotel is located in the Marina area of the golf resort of Vilamoura in the central Algarve. The hotel overlooks the Marina and is within a short walk of the beach. The hotel has 243 bedrooms providing holiday accommodation for two adults and with wheelchair access. They are all well decorated with modern comfortable furnishings. The Vila Gale Marina Hotel bedrooms have balconies and are equipped with satellite TV, direct phone, radio and a mini-bar. Vila Gale Marina Hotel facilities include its Health Club with massages and treatments, an indoor pool, sauna and steam baths, a restaurant, a snack-bar, two bars, an outdoor pool and one for children, Wi-Fi, a Fitness Centre, a Kids Club in season with a playground, a games room and two floodlit tennis courts. The hotel is surrounded by shops, bars and restaurants and a short walk to the Vilamoura Casino. There are six 18-hole golf courses in the near vicinity.